Though I've visited Amsterdam many times, I've never been to the tulip fields. During this recent trip, I made it a point to go to Lisse to see the profusion of colorful tulips at their peak. It was beautiful to stroll around the 32-hectare Keukenhof Gardens. While it was overcast, it wasn't cold at all and a few sprinkles didn't warrant an umbrella. 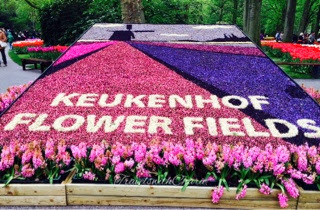 There are more than 7 million tulips, daffodils and hyacinths grown at Keukenhof. The incredible variety of tulips and amazing colors are every photographer's dream. This is truly a feast for the eyes. The flowers are artfully planted in diagonals, horizontals, verticals, patchwork, and many elaborate patterns. There's a windmill on site, a Japanese garden, a stream running through the gardens, fountains and playgrounds and so much more. You just need comfortable shoes and well rested legs for the long walks. It’s a special privilege to have a garden. When I wake up in the morning, I stand by the French doors to see the flowers blooming, the trees swaying in the sea breeze, and more banana trees sprouting though the old mama banana has not yet borne any fruit. I just planted several ti plants this week to give more color to my elongated yard and hide the ugly cement fence. When I first paid attention to these plants in Bali, I thought how beautiful it would look to have a profusion of them. They grow tall and the crimson leaves are eye catching. I’ll need at least two dozen of these to cover the walls. My garden is still evolving. I am hoping to bring the lush landscape of inland Capiz and Bohol into my home. But some plants are a little difficult to find like the Madagascar palm tree. So far I have a few young palms. They take a long time to reach six or seven feet but if I start cultivating them now, I’ll enjoy seeing them reach their maximum height.